Author: Giff, Patricia Reilly Set In . . . Description: We will dance on the cliffs of Brooklyn. 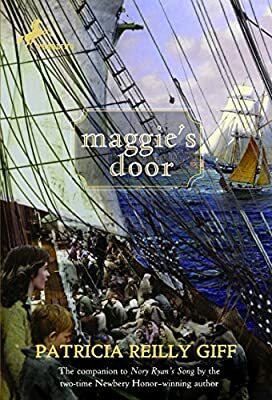 Maggie’s Door is the story of the journey from Ireland to America told by both Nory and her neighbor and friend Sean Red Mallon, two different stories with the same destination—the home of Nory’s sister Maggie, at 416 Smith Street, Brooklyn, America. Patricia Reilly Giff calls upon her long research into Irish history and her great powers as a storyteller in this deeply involving, riveting stand-alone companion novel to Nory Ryan’s Song.